Here we are at the airport in Madison, waiting for our flight to Denver! I asked a fellow passenger to snap this on our cell phone. Only had to run 40 gates at Denver to make our connection...with two carry-ons, plus Joshie. He did so good on all the flights there and back. 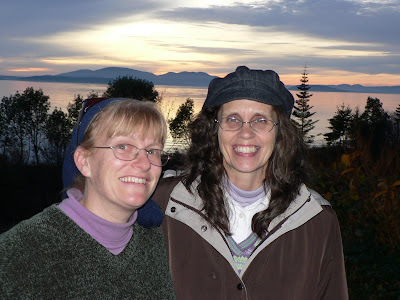 This is Linn and me, with Puget Sound behind us at sunset. Joshie and I took a trip to Seattle to see our dear friend, Linn Dappen. I was very thankful for the special time and for Dave twisting my arm to set a date and go for it. Somehow, everyone survived in my absence -- with only two black eyes (out of a possible 24 eyes, that is not too bad!). 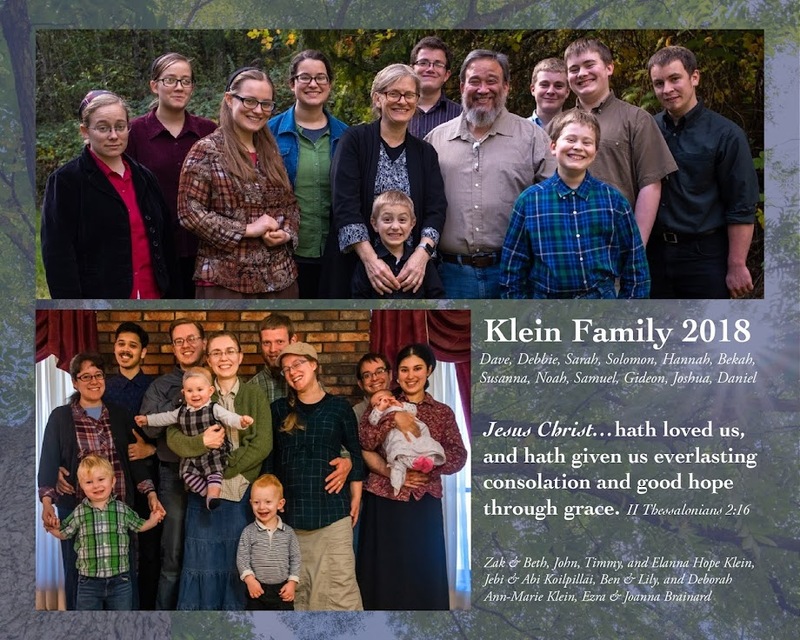 Linn and her family have been working in Mexico as missionaries for over 30 years. 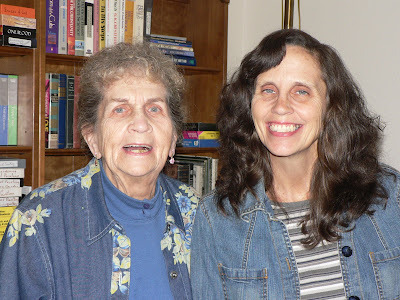 This is Linn's first visit with her dear mom since Linn's husband, Art, went to be with the Lord two years ago, and she had not seen her mom for five years. 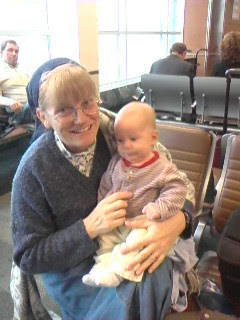 We met her mom, Grandma B, when we traveled to Washington for Art's memorial service in 2006. Mary Ann is such a dear, dear lady! If you ever meet her, you'll call her Grandma B too! She is full of 87 years of life! While I was there, we learned her doctor found an aneurysm in her aorta. The specialist said he cannot operate. Grandma B is a very vital part of the family, very much a support for everyone. She has such contagious hope and frequently claims Romans 8:28 for everything that comes up in life, good or bad. She continues to plow ahead with projects she would like to complete...but heaven is definately her aspiration. She is very loved by all who know her. Linn's daughter, Sarah, and her family of 8 children, also live in Washington. They are a very sweet and fun family. Our family instantly clicked with them during our visit in 2006. 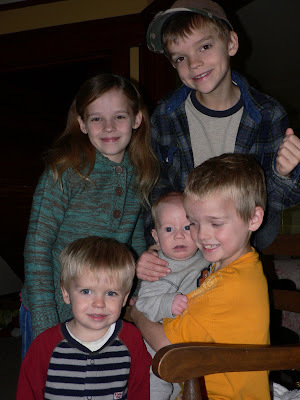 Jim and Sarah's children filled in as temporary siblings for Joshie. Joshie got a little stressed out by the peace and quiet of Grandma B's house, so our visit at the Colemans brought back a sense of "normalcy"! 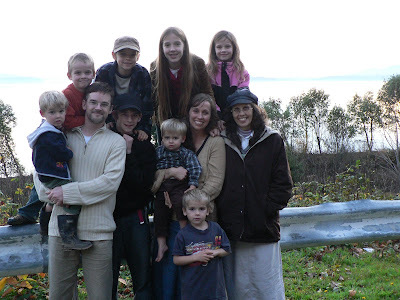 We continue to pray for Linn and her family as they face many decisions and seek to minister. God has used them tremendously, and they have been an incredible encouragement to us! Joshua Arthur is named for Art. 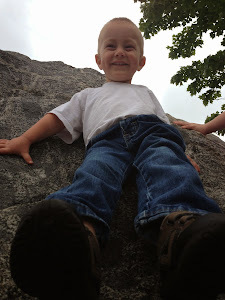 Thank you for sharing these moments with Linn, We miss your family and the Dappens' family very much. We wish we could have somehow been neighbors and grew up together because we have so much to learn from you all. 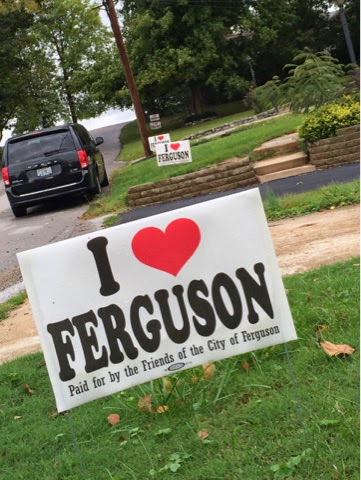 God bless you and we love you and the work you do. still learning the joys of being mom to eight.